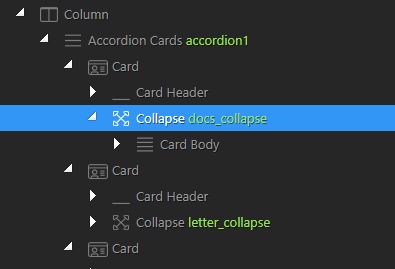 I have a single accordion card I’d like open by default. IS there a way to set that? 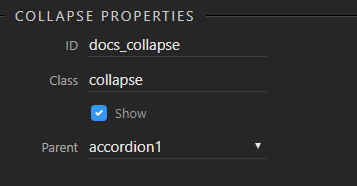 then select the Show checkbox on the Collapse Propertied panel. Thanks Ben, that did it! Just between you and me, I think that the ‘show’ checkbox is supposed to add the ‘show’ class rather than insert 'show=“true” ’ which does nothing. Actually there is a very good reason for the ‘show’ toggle to be an attribute. But the question comes down to how did you define the collapse? 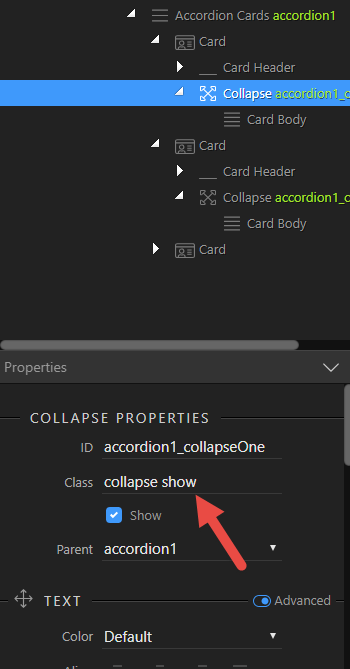 If it has the attribute is="dmx-bs4-collapse" then it is the App Connect component (which is default when you insert it through the UI) and then the show attribute should work. If it is just a regular Bootstrap 4 collapse (just has the ‘collapse’ class on it not an ‘is’ attribute) then only the ‘show’ class will work. Anyway to make difference of those two components, I think we will just implement them both separately as regular collapse and dynamic collapse and not as a single one like now. And you will be able to convert from static to dynamic so no breaking changes. Added the card through the UI. Checking or unchecking the ‘Show’ box made no difference.